Always a joy to see although because of its thorns not one to tangle with, the Dog Rose can be either self supporting or a climber. The tallest specimens almost invariably use other plants for support. 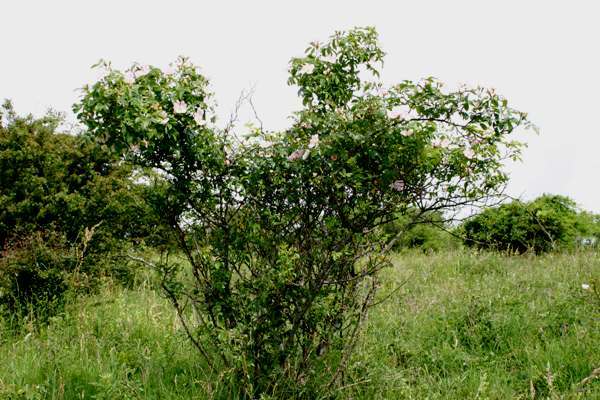 A distinctive perennial with tall arching stems covered in curved thorns, the Dog Rose has dark-green toothed oval-pointed leaves and pink or white five-petalled fragrant flowers 3 to 6cm across. This lovely summer wildflower is very common throughout central Britain and Ireland, while in coastal areas it is generally less evident, and there the low-growing Burnet Rose tends to take precedence. Rosa canina makeswonderful displays in hedgerows and on woodland edges. Dog Rose can sometimes be seen in flower in Britain and Ireland from the end of May until early August, but most years they are at their best during June and July. 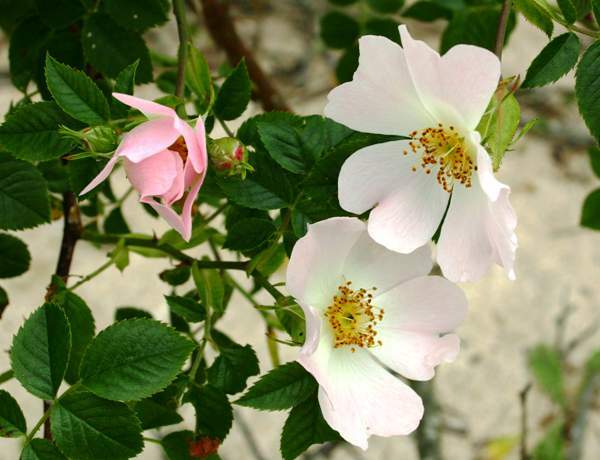 There are several wild rose species, including the white Field Rose and the Burnet Rose. Briars, brambles, raspberries and cloudberries are close relatives, while many other wild flowers also belong to the Rose family; Wild Strawberries, Wood Avens, Tormentil, Hawthorn and Crab Apple are just a few examples. Not surprisingly, the sweet-smelling petals of the Dog Rose have been used in making perfume, while the fruits, known as hips, are used to make rose-hip syrup as well as tea and even a kind of marmalade. There is just one thorny problem that makes gathering rose hips a risky business: the thorns! The specific epithet canina means 'of dogs' and is a rather disparaging term meaning of little or no value - surely quite inappropriate for this much-loved wildflower. The seeds of roses develop in shiny cases called rose hips. 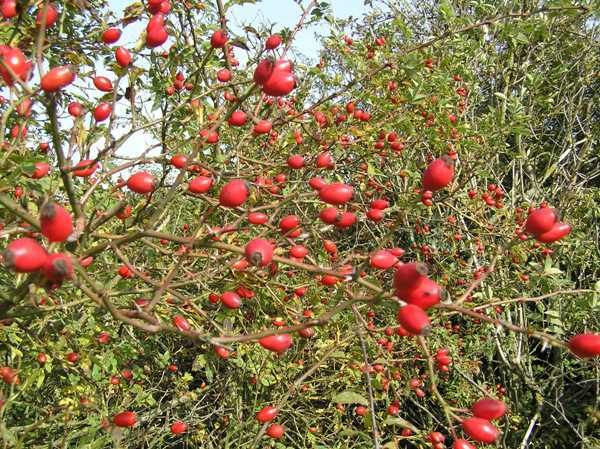 Pictured on the left are hips of the Dog Rose, which turn bright red in the autumn when they are fully ripened. The photographs shown above were taken in Newborough Warren National Nature Reserve in Anglesey, North Wales in June. 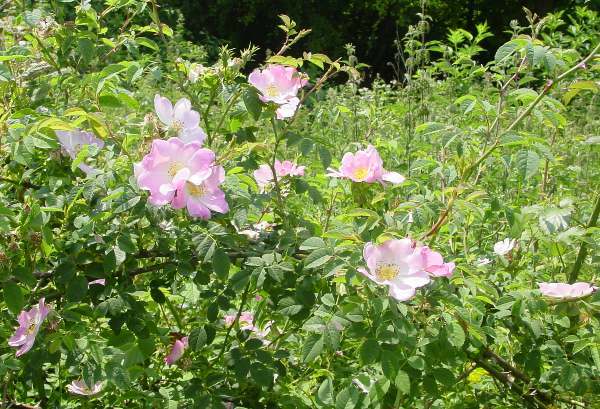 The self-supporting Dog Rose pictured on the left was seen on scrubby chalk downland in Hampshire, England.